A recent review of the social media efforts by 600 financial institutions revealed a surprising number of social mistakes that were hard to ignore, but easy to fix. Unfortunately, too many banks and credit unions don’t bother to continually assess their social media elements, so they end up sacrificing followers and hurting their social images. 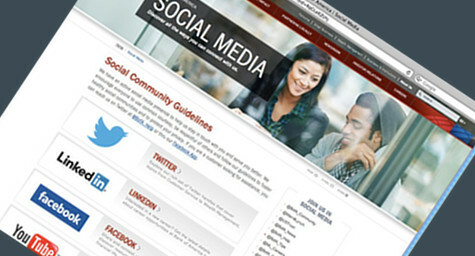 To help banks and credit unions repair their social media mistakes and avoid making more in the future, TheFinancialBrand.com posted these simple suggestions for fixing social media slip-ups. 1. Place Links to Active Social Media Channels on Your Homepage – Show people that your bank or credit union is active on social media channels by prominently displaying the links to these channels on your website’s homepage. Have bold, direct links to each of your channels and strive to have these links visible on every page of your site. 2. Fix Broken Social Media Links on Your Homepage – Few things online are more irritating than links that don’t lead anywhere. Whether the financial institution changed the name of their social media account but neglected to update their website, or the company accidently linked to the wrong account, it’s essential to continually check all social media links to make sure they lead to the proper places. Remember, correct URLs follow the same basic formula of the social media channel’s name, followed by a slash and then the financial institution’s name. 3. Fully Fill Out Social Media Profiles – Make sure to complete every part of your profile on every social media channel. It only takes a little time, but can make a big difference in the overall look and usability of the page. 4. Cross-Promote Your Social Media Channels – Building a social media community can mean doing anything and everything to gain more followers. One wise move is to cross-pollinate your social media accounts so that each individual channel contains links to the others. Most of the leading social media channels allow you to include links and URLS with ease. 5. Handle Speed Bumps Wisely – About 80 percent of financial institutions add speed bumps between their websites and social media pages in order to comply with regulations. These can be extremely annoying to users because they open up a number of useless windows. To help ease this situation for users, do whatever it takes to avoid the creation of additional windows. After a user clicks “continue,” make sure that they are instantly redirected to the social media page within the same window. These speed bumps may be deemed necessary, but you can make it as speedy as possible for users to get through them. Try to incorporate these quick fixes to make the most of your social media presence. As these tiny tweaks show, it only takes a moment to make a change that can be truly momentous. To optimize your social media presence and promote your financial brand to its fullest potential, contact MDG Advertising. MDG Advertising, a full-service advertising agency with offices in Boca Raton and New York, NY, is a top credit union marketing company, whose clients include IBM Southeast Employees’ Federal Credit Union and Lafayette Federal Credit Union. Our 360° integrated approach uses just the right mix of traditional and digital marketing to reach your advertising goals. While some industries may fare better in print and others online, we strive to create a balanced approach, where traditional and digital marketing efforts support each other and your message is tailored to the medium. To learn more about the latest trends in credit union marketing and advertising, contact MDG Advertising. Read more at The Financial Brand.